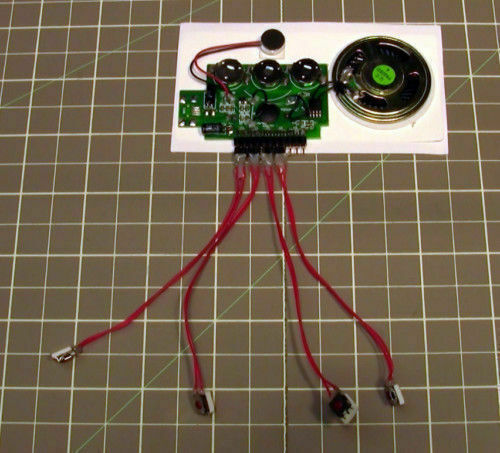 A user recordable sound module for the Do-It-Yourself (DIY) crafters and hobbyists. Weight: 0.85oz. Use in printed projects, invitations, greeting cards, craft projects, scrapbooks, electronic projects and more. works great but they all needed new batteries. easy to use and sounds pretty good. But all the batteries were dead. This is an awesome little voice chip...easy to use and has good sound quality! I retrofitted to a three button intercom unit on our F.R.I.E.N.D.S wall so that, everytime you push a button, it plays sound clips from the show! CRICUT ULTIMATE FINE POINT PEN SET OF 30 MARKERS NEW! Darice A2 & A7 Embossing Folders: Lots to choose from / combine shipping: NEW! !